As the floors above had already been constructed, the option for safe demolishment was no longer applicable. Instead, the contractor called for prospective suppliers to put forward alternative solutions involving strengthening or replacement. Following presentations from several companies, the contractor decided that CCL’s proposal was the most feasible and technically sound. In order to accurately check for and assess any signs of early settlement or deflection, CCL carried out crack mapping and deflection measurements. Back propping of slabs took place on levels five and six, and column replacement was done in stages, to take into account load transfer on all props and beams throughout this process. Strengthening of the core walls was successfully completed through the addition of reinforced concrete columns. CCL proposed introducing additional drop caps to columns in order to protect against punching shear. As recommended by CCL, carbon-fibre-reinforced polymer was installed in a number of locations. 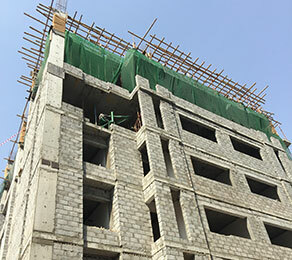 High-strength, non-shrink concrete was used to create all the vertical elements during works. After replacement of all vertical elements, CCL undertook further crack mapping and deflection measurements to check for any movement in the slab.